The Lumenis One laser system is a highly advanced, innovative tool that can help your cosmetic practice expand. As one of the most versatile laser systems on the market, the Lumenis One can be used to perform a variety of cosmetic treatments quickly and safely in a clinical setting. Offering the flexibility needed to perform the most popular types of skin treatments, the Lumenis One is a smart choice for growing practices. Known for delivering outstanding results in less time than other systems, the Lumenis One utilizes Opitmal Pulse Technology to protect skin during treatment. This specialized technology allows more cooling time in between pulses to help skin stay cooler and more comfortable throughout the treatment. 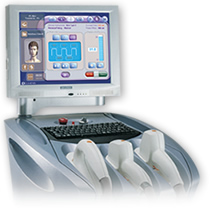 The system is perfectly safe for use on all skin types and doesn’t require any downtime after treatment. Patients of all skin colors and types, including those with tanned skin, can safely use the Lumenis One. When you’re looking for the ultimate aesthetic laser system that delivers powerful results and that can perform a variety of treatment options, look no further than the Lumenis One. Patients can enjoy safer, faster laser treatments, while your practice can take advantage of the growth in business. With the Lumemis One, your practice can start offering the cosmetic treatments that your clients want the most. Interested in adding the Lumenis One laser system to your cosmetic practice? The Lumenis One is the perfect addition to any busy cosmetic practice looking to expand its service offerings. With the Lumenis One, you can provide safe and effective skin resurfacing, acne treatments, removal of lesions and permanent hair removal, all in one machine. SunrayLaser.com has amazing deals on used Lumenis One laser systems with savings that are up to 60% off the original price! See for yourself how much you can save on high quality skin resurfacing equipment like the Lumenis One and other used laser equipment when you buy from SunrayLaser.com. If you are looking for pricing information on a pre-owned Lumenis One system, fill out the contact form below and we’ll send you a free, no obligation quote.